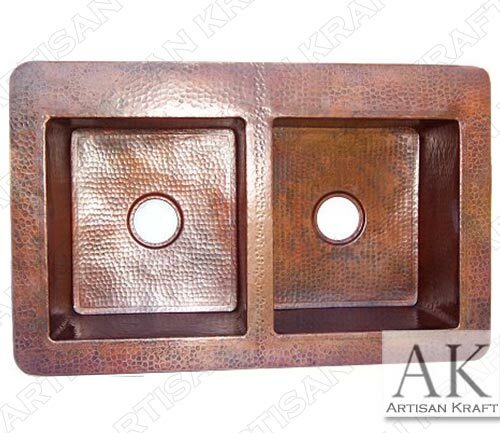 A double well copper kitchen sink with a hammered finish. It can also be called a two bowl sink or a double basin. This style is one of the more standard kitchen sinks. It is typically over mounted on the counter with the flat edge spilling over the countertop. In more recent trends these are now under mounted with the flat edges sitting below the counter top and having the inch or so of the counter top exposed where the two meet. This style is fitting for any home. Copper has a lot of great qualities beyond just looking good. To find out the health benefits and other great reasons for buying copper products click on this copper kitchen sinks link. For pricing $ information please give us a call or email us.